A mile offshore from the Isle of Wight, appearing to float in the Solent Sea, you can find one of Britain’s most unique Victorian structures. Built between 1867 and 1880, No Man’s Land Fort has recently been re-launched as a luxury hotel and party venue by the Clarenco Group. Designed originally to house 80 soldiers to defend the country from possible invasion, the Clarenco Group have turned it into a unique get-away destination. It has 22 luxury bed rooms, a dining room that can seat 200 people, games rooms, lazer battle arena, an outdoor terrace with a sun deck, a hot tub, a sauna, and of course, a parking space for your helicopter! Lock-Tech Systems were proud to be employed to design and install the hotel access control system for this exciting new project. The client was particularly concerned about providing a feature rich technical solution that was still in keeping with the aesthetics of the doors inside the fort. 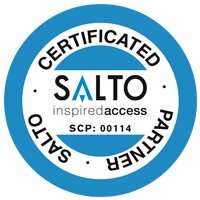 To meet this specification, Lock-Tech selected the SALTO Aelement electronic locking system, which provides all the features of SALTO’s award winning access control with the ability to incorporate the uniqueness of the client’s existing door handles. As always, Lock-Tech delivered on time and to budget despite the challenge this unique project presented.